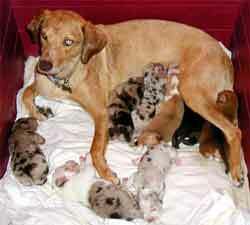 The Catahoula Cur is commonly referred to as the Catahoula Leopard Dog or the Catahoula Hound. It is an American breed of dog that hails from the Louisiana Parish of Catahoula. Of all the American dog breeds that there are in North America these dog families is thought to have occupied the North American continent the longest. In fact it is rumored that the breed originally had its start in Native American created stock. Although you may hear of the breed being referred to as a Catahoula Hound it is really a cur and not a hound at all. Current breed history seems to indicate that the dog originally had its roots established from descendants of war dogs such as the Mastiffs or the Greyhounds. These dogs are reputed to have been brought to America by Hernando de Soto as early as the 16th century. The dogs which were left behind by the Spanish explorers were interbreed by the local natives with their domestic dogs. Most people seem to think that Native Americans breed their dogs with wolves but recent research that has been conducted concerning the dogs DNA fail to support such a notion. Dog DNA supports the same codes as those found in European and Asia type domestic dog samples. The simple fact of the matter is that these tests and studies have concluded that Native Americans just may have brought dogs with them during their trip from Asia to North America. The French settlers during the 1800’s would comment upon the strange looking dogs that had haunting eyes and were used by the Indians when they went hunting. It was often thought that perhaps these dogs were the result of interbreeding of the war dogs and the red wolf. However research has proven this theory to be inaccurate. Many famous people had Catahoula as pets. Jim Bowie has been reported to have owned several Catahoula which would bed down with him at his feet as he slept. In the early 1900’s it is said that Teddy Roosevelt made use of one of these fine dogs when he went hunting. The Louisiana Governor Earl Long had such an interest in the animals that he collected them. To show that this dog was as much a part of Louisiana as the great tasting food that they eat in 1979, the people of the state convinced Governor Edwin Edwards to signed a state bill which made the Catahoula the states official dog. While as late as 2007 the dog was elected as Louisiana Cenenary College’s mascot. The dogs generally are about 26 inches high and weight in the neighborhood of 90 pounds. These dogs may not be the most attractive animal in existence however the fact of the matter is they were breed more for their working abilities then for looks. The coats found on the Catahoula Leopards are short and dense and come in a vast array of colors although most are of a solid color. A black Leopard will appear with small patches of either blue or gray. Those with red or brown coats will possess lighter patches of the red or liver color. This article is published under the GNU Free Documentation License. 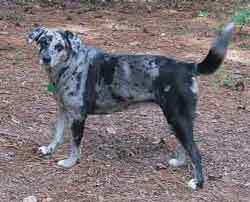 It uses material from the Wikipedia article "Catahoula Leopard Dog".